For their home away from home, the Robertsons wanted to create a space that would make every weekend spent here feel like a vacation. This transitional style kitchen features a mix of Marsh's Savannah 1 & Savannah 2 for a classic shaker style. With its clean, simple profile, shaker represents a typically transitional element and has long been a popular choice among homeowners. Adding a touch of contemporary is the Graphite stain combined with sleek, stainless steel hardware. 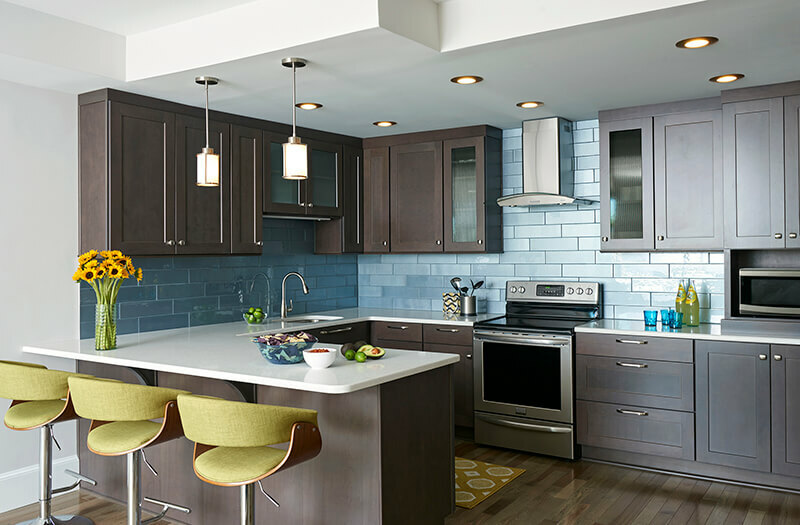 The pendant lighting and ocean blue backsplash tie everything together by introducing the subtle embellishment to this otherwise laid-back space.